I realized that I never really discuss my Monthly Adventure swaps or share the goodies I have received. Swapping is so much fun: you meet some great people and get fun presents! So from now on, I will starting posting about my swaps. My favorite group on Ravelry is Monthly Adventures. I know I have mentioned it before here on my blog. It started as a simple holiday swap last year (my first swap ever). It has evolved into a month swap with occasional small KAL/CALs. It's a great group, very chatty, fun, and supportive. I look forward to reading the posts every day from this group! So for June, the swap involves lace. We are sending and receiving a pattern and yarn for a lace shawl or stole. We helped our partners out by listing some of our favorite patterns in Ravelry. It is fun to secretly 'spy' on your partner to discover fun gifts for them. This month my package came from the same person I sent a package to! I am so excited. Above is my package from 'GreenAlgae'. She sent me a pattern I have been wanting to make for SOOOOO long: Hanami ! The Hanami stole was designed by Melanie of Pink Lemon Twist (the creator of Mystery Stole 3/Swan Lake which I knit last summer--see below). I can't wait to cast on! But of course, I do need to wait, because I have 2 projects I absolutely must finish first (Zum dirndl and SKP sock 3, which I haven't even cast on yet...). My desire to start this pattern will be inspiration to finish the other two. 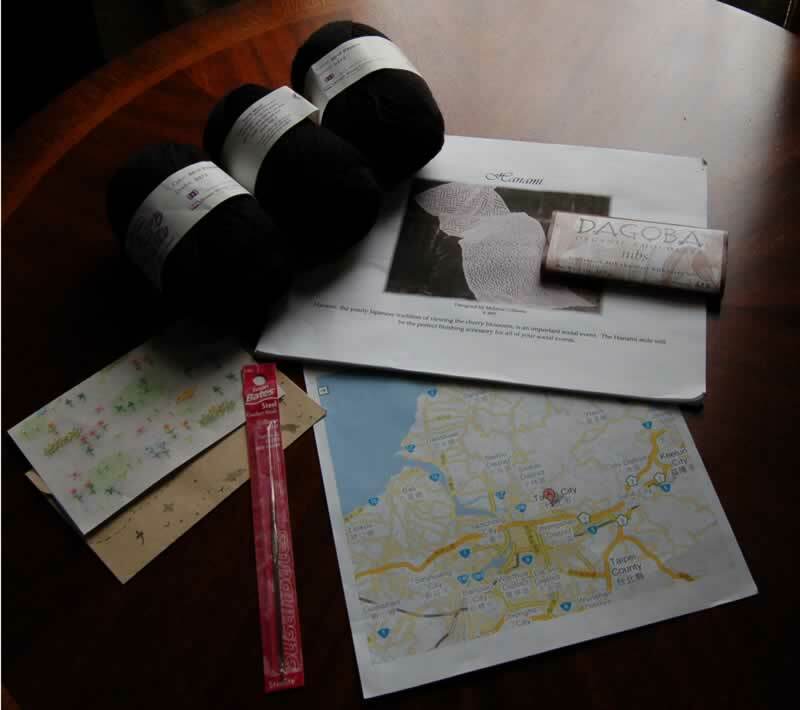 Thank you GreenAlgae--I am off to knit!